Profile : “Indian students are far more adaptable to new environment than any other international student,” says Saloni Mohan, who’s back from her student exchange program at ESC Rennes, richer in life experiences. “I was keen on going on a student exchange program even before I got into my management course. 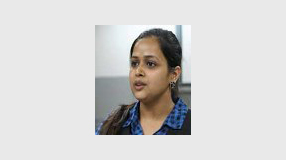 In fact, that was one of the things I was looking for when choosing a college to pursue my management studies,” says Saloni Mohan (Class of 2015), who saw her dream realised with FORE School Of Management, New Delhi. She knew she had accomplished something when she got selected for the student exchange program at ESC Rennes. And, once in Rennes, Saloni thrived in the experience. According to Saloni, choosing between an internship and a student exchange program can be a difficult choice for management students. But for her, the choice was obvious: “I wanted to have the experience of studying abroad before completing my final education. I even studied French before joining my management program.” The desire ability to plan ahead, like learning French, is surely one of the things that helped her get through the program with ease. Saloni was also impressed by the warmth she experienced from her faculty members right from day one. “We had an orientation program on day one and the teacher who was welcoming us was very friendly and warm. We felt at home right from the first day,” she explains. Her experiences in France have also made her aware of the needs of foreign students coming to India. “We have to understand their point of view, which is very different, and be more patient with them,” she adds. Outside of the classroom is here Saloni had her biggest thrill. She used savings from her previous job to head to Barcelona for a sky diving adventure that she had been looking forward to for some time. But the day turned out to be filled with more adventure, something that only adds to your travel experiences. “We got lost on the way to the sky diving place and got led in the wrong direction. Sky diving was amazing, but we missed our flight in the process, since it was Sunday and transport is slow. But,” she says, “I was secretly rejoicing that I had one more day in Barcelona.” Saloni, the fun-loving adventurer, also ended up making friends with her sky diving instructor. In fact, she made friends with many on the campus, she admits: “We’d hang out at nights and exchange stories. This four-month program exposed me to different things and gave me a lot of memories; but, best of all, it’s made me comfortable with people from all over the world. I don’t want to work in France,” she says, “but I definitely want to travel more.” With this amazing experience behind her, Saloni now looks forward to more such adventures in the future.